Managing multi-channel communications within a single corporate marketing function is challenging enough. But if your organization has a corporate marketing entity that also supports local or regionally distributed marketers, you know it’s exponentially harder to manage brand consistency and the customer experience in this environment. 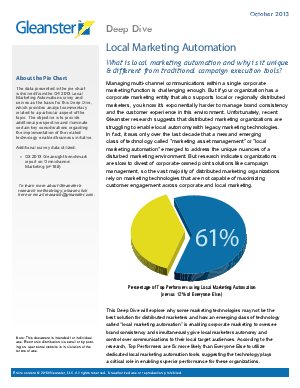 Unfortunately, recent Gleanster research suggests that distributed marketing organizations are struggling to enable local autonomy with legacy marketing technologies. In fact, it was only over the last decade that a new and emerging class of technology called “marketing asset management” or ”local marketing automation” emerged to address the unique nuances of a disturbed marketing environment. But research indicates organizations are slow to divest of corporate-owned point solutions like campaign management, so the vast majority of distributed marketing organizations rely on marketing technologies that are not capable of maximizing customer engagement across corporate and local marketing.